GHB is a sedative used both as a prescription sleep-aid and as a recreational intoxicant. It is known for its ability to induce a short (several hour) coma-like sleep at high doses. 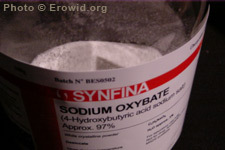 A number of GHB-related deaths in combination with its addiction potential led to it being controlled by Federal law in 1999. GHB's dose/response curve is similar to that of alcohol : At higher doses, users fall unconscious and are temporarily unable to be awakened (coma). It may also dangerously depress breathing. Avoid Mixing With Alcohol. Erowid strongly recommends that all liquid GHB be colored with blue food coloring. This serves a dual purpose of reducing the chance that it will be mistaken for water...as well as reducing the possibility that it can be added to a drink without someone's knowledge. What are the negative effects of GHB use? Driving under the influence of GHB?